TWP 300 Stain products are designed for staining and preserving outdoor furniture, picnic tables, playground equipment, and shutters, doors, and windows. 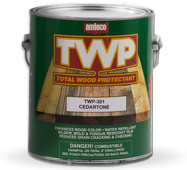 TWP® 300 SERIES is a high performance, high solids, exterior wood finish, which may be applied to obtain a stained or high build, deep gloss finish, depending on application procedures. TWP® 300 SERIES provides a transparent natural wood tone finish which enhances the natural beauty of the woods grain and color. TWP® 300 SERIES has superior U.V., waters and abrasion resistance. The finish is also extremely resistant to attack from mildew and wood destroying organisms. Refer to the Product Data Sheet (PDS) for preparation, cleaning and application instructions. This product is for above ground use only. TWP dealers can find additional product information on the Material Safety Data Sheets (MSDS). All 5 Gallon Pail & 4 Gallon Case orders of TWP Stain ship FREE when ordering online. TWP® 300 SERIES is available in 8 popular colors and clear. TWP® 300 clear is not intended for color retention and will allow the wood to gray naturally. TWP® 300 SERIES is available in a 350 grams/liter V.O.C. formulation and a 250 grams/liter V.O.C. formulation making it available in all 50 states.